In 1997, my husband and I began the large process of building a house. We labored over plans and lots, lighting options, roofing colors, and all those crazy details that you have to make decisions on when you choose to build a house. Because it is my nature, I wanted everything to be perfect. I am happy to report that with age comes some wisdom, and I now know that nothing is perfect, but back then, I was determined that every detail should be just so. After all, you get to do this one time and we would be stuck forever with any mistakes (or at least that is how it felt). We had planned for the front of the house to be brick. Then we turned the garage to the side and decided to do that all brick, too. Then the lot we picked out displayed the other side quite a lot, so we finished that in brick, too. My father-in-law, who is a mason, told my husband, “Heck, we might as well just do the whole thing brick!” And so we did. 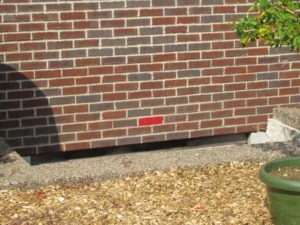 I love, love, love the color of our brick. It is a deep, not quite purple, not quite burgundy color named “Williamsburg”, which fit our house so perfectly. My family is from the east coast (Virginia) and after visiting there a few times, Steve and I really loved all the brick houses in that area. The fact that my grandparents met on a blind date in Williamsburg, VA made the whole thing seem like it was meant to be. And perfectly so. At this point, I probably should disclose that my father-in-law, Leo, is a funny guy. We even have a name for this phenomonia: ‘Papa Leo humor’. He delights in making silly, harmless cracks, comments and practical jokes. During the building of our house, which he very graciously donated a lot of time and his expertise to help us complete the brick work on, the days must have just gotten too long for him and he played a little joke on us. He snuck in some of these awful bright red bricks. One is on the front of the house – You can’t miss it. The other is on our chimney. And truthfully, Leo (my father-in-law) did very, very generously pour his heart and soul into the building of our house. He did not just do it out of obligation. It was his art, his craft – and he treated it like the special project it was to Steve and I. He did a fantastic job and our house would not be nearly as beautiful to us without his efforts. So, I technically let it go. Over time, I did notice the bright red brick less and less. Now, 15 years later I rarely notice them. The other day I was watering the plants in our front yard. I noticed the red brick. And, for the first time ever, I smiled. I just could not help it. It IS kind of funny. I realized that whether Leo meant it to be this way or not, the red brick has become symbolic for me. Life is NOT perfect. And I can drive myself mad by fighting it, or I can embrace the odd, unplanned and funny things in life and enjoy the ride. Over the past 15 years, I have realized this a hundred times over. In a way, the red brick was a gentle early lesson that life is wonderful if you can just relax a bit. Of course, our house was never perfect in the sense I wanted it to be. Things have needed redoing, updating, repair and other work consistently over the years. There is always something else to fix or complete or start. But it is OK. Because our house is perfect in this way: We love each other. We have real relationships, a nice place to live that we can share with others in celebration or sorrow or as a safe place to stay when needed. It shelters us from storms and is messy, chaotic and glorious on a daily basis. We really LIVE here. And that is perfect in the sense of what it was supposed to be and do. I suspect that Leo knew this all along and the brick was his way of telling me not to take myself too seriously. I am grateful that Leo is still very much alive and well. Now 70 years old, he is enjoying his retirement (mostly, sometimes he still works :-)) and still generously shares all that he has with his family and friends. We are so lucky to have him in our life. With the recent passing of my father, I could not help but think of all the people we will eventually have to say good-bye to. I hope it is not for a very long time, but when Leo does pass away, I suspect that those bright red brick will be my favorite thing about my house. Great story Michelle – and a wonderful reminder to accept the imperfections in life. …that would have drove me crazy 15 years ago too, but now I can enjoy the humor and delight in the story of the red bricks too. Interesting how time and experience shape us. Thanks; that was truly an excellent post.